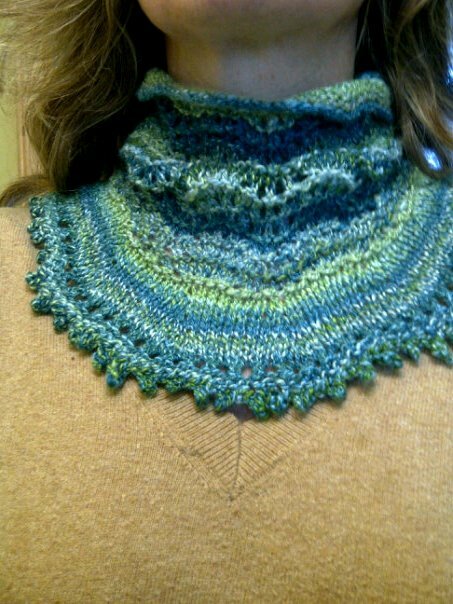 Last year I purchased a skein of yarn at my LYS – local yarn store – 88 Stitches. I was inspired by it because it reminded me of the autumn colours you see back east at this time of year. I didn’t have any particular pattern in mind, or even a thought about what kind of an item I would want to knit up. I just loved the colours. I started knitting a pair of socks, but stopped because the yarn just striped and I wasn’t looking for a pair of striped socks. Ripped it out. So I tried something else. 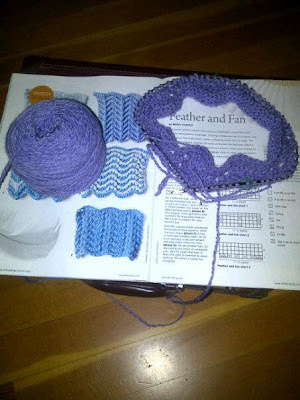 I started a scarf from which uses a dropped stitch pattern and blocks of knitting and purling. The end product looked woven. It would be a lovely scarf/wrap in any other yarn. But this one just wasn’t working. It sat there in my UFO box. On Sunday, inspired by the fact that I no longer had to focus on getting those items completed for the sale, I was FREE to play and imagine new things. So I headed to my studio and took out some fun yarns I have had on the back burner. I had this small ball of lovely merino left over from a pair of socks I made. I wanted to try the Feather and Fan Lace pattern, so grabbed that yarn to do a test swatch. Row 3: K2tog – 3 times, YO knit 1 – 6 times, k2tog – 3 times. Repeat across the row. A variation of the patterns adds a stitch at the beginning and the end – so it is 18 stitches plus 2. Knit the first and last stitch on row three. Not only was it easy to knit, I loved what was happening with the colours. They weren’t striping, they were pooling. That’s exactly what I wanted the Fall Coloured yarn to do, but hadn’t yet found a way to do this. 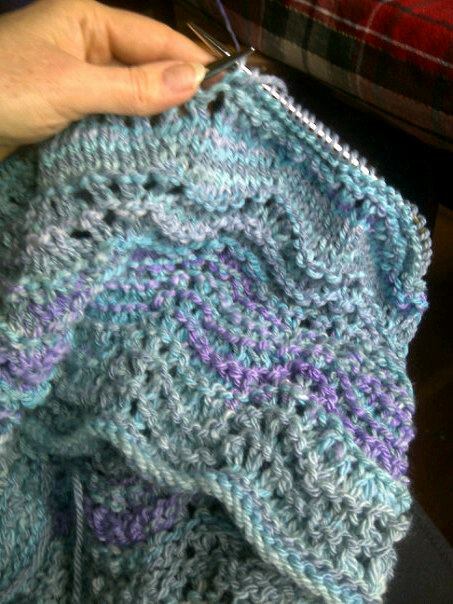 This one was pooling in two distinct columns, which is kind of pretty, but not what I had in mind for the Fall yarn. I ripped out the dropped lace scarf and was secretly happy because I could reclaim all my abalone stitch markers. Re-wound the ball — and dug up some slightly larger needles than the ones I used on the test swatch. For that I used 3mm. I grabbed the 4mm, cast on 38 stitches and started knitting. In a very short while I realized I had found what I was looking for. It’s really hard to imagine how happy this made me — so happy in fact I tried to share my enthusiasm with sleeping hubby. Got a much better reception from the gals at work the next day. Here it is. It is what I envisioned — it looks like an eastern forest in mid October. The golds, oranges and reds are at their height causing the dark greens from the evergreens to stand out. The rocks on the windowsill say it all. This entry was posted in feather and fan lace on October 27, 2010 by DianaTwiss.